Besides her awe inspiring beauty and talent, Angelina Jolie is as well popular for her ink passion and love for body art. Since her debut in the movie world, we had chance to see an ample of many symbolic and artistic tattoo design on Angelina’s body. Every tattoo that she have, represents something deeply meaningful and holds huge symbolic and sentimental value. Check out below the best of the best Angelina Jolie’s tattoo designs. Enjoy! The Arabic script tattoo on Jolie’s right arm in translation means “Determination”. She got this tattoo to cover the abstract line tattoo that she had done together with her ex husband. 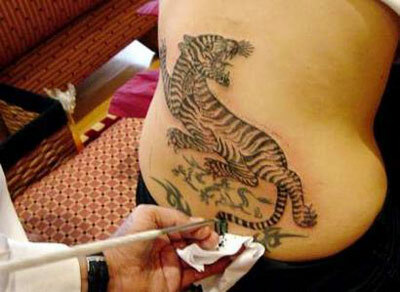 The Bengal tiger tattoo design on Angelina’s lower back is one of the most daring and bold tattoo that she ever had done. This is an old tattoo with the name of her ex-husband Billy Bob. Angelina removed this tattoo after 5 treatments at the Tattoo Removal Clinic. This is one of her most significant tattoos. Right next to the bold cross there is a Latin quote tattoo that says “Quod me nutrit me destroit” meaning “What feeds me, destroys me”. The Buddhist pali on her left shoulder blade Angelia got in Bangkok, Thailand. This tattoo design consists of a Buddhist Pali incantation written in Khmer script which is an official language in Cambodia. This tattoo design has the biggest sentimental value among all Angelina tattoos. This tattoo has a geographical coordinates that show all the places where she had adopted or born a child. The know your rights tattoo is a title of Angelina’s favorite song. Angelina got this tattoo to cover another tattoo that she had done together with Billy Bob. This tattoo on her left shoulder blade is a Japanese sign for courage. Did we miss some Angelina tattoo designs? Share more Angelina’s tattoo designs in the comments below.